Johann Georg Sulzer’s ‘Recitativ’ and North German Musical Aesthetics: Context, Translation, Commentary,” Music Theory Online 23/2 (2017). 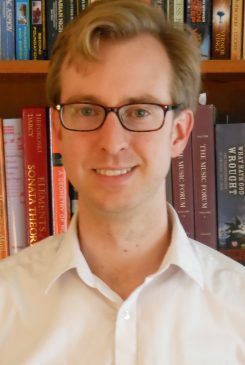 Matthew Boyle is a music theorist whose research focuses on the analysis and history of eighteenth- and nineteenth-century opera. His dissertation examined issues of pleasure and enjoyment in the operas of Gioachino Rossini. Ongoing research projects include the analysis of secco recitative, musical form in early two-tempo arias, as well as music and music-making in the nineteenth-century American South. His research has been published in the Journal of Music Theory and Music Theory Online. His article “Galant Recitative Schemas,” co-authored with Paul Sherrill, was recognized with the David Kraehenbuehl Prize in 2016 and the Society for Music Theory’s Emerging Scholar Award (for an article) in 2017. Matthew Boyle previously taught theory and aural skills at Indiana University as an adjunct lecturer and associate instructor, receiving the Wennerstrom Associate Instructor Fellowship for teaching excellence in 2014.